Historical information and statistics about Fukushima Daiichi Reactor 4. For current updates, click here. The fourth of the Fukushima Daiichi reactors to be built. At the time of the earthquake unit 4 was shut down for extensive maintenance. The rod assemblies were removed from the core and stored in the spent fuel pool. Some of the extensive work to be done was the replacement of the reactor vessel shroud. Unit 4 lost AC power along with the other units at the plant. At 4:08am JST on March 14th, the spent fuel pool at unit 4 was 84 degrees celsius. At 6:20am JST on March 15th a part of a wall in the operation area of Unit 4 of Fukushima Daiichi was damaged. TEPCO provided no further details on this damage. At 9:38am JST on March 15th a fire broke out in the reactor building of unit 4, the fire was reported extinguished by 12:29pm JST. TEPCO has changed their story on unit 4 multiple times but eventually admitted to a very obvious explosion occurring at unit 4. No video of unit 4 exploding exists to date and it is assumed the explosion took place before dawn. One of TEPCO’s later admissions regarding unit 4 is that they think hydrogen leaked into unit 4 from unit 3 via the venting pipes and a faulty valve. No reason was given as to why unit 4 did not then ignite when unit 3 exploded. The blast at unit 4 did extensive damage to the structural integrity of the building. TEPCO has admitted the blast ignited within both the lower floors and upper floors of the building. A concrete entrance garage can be seen to have the wall panels blown out. An inner staircase was identified as destroyed by TEPCO. There is extensive obvious structural damage. The spent fuel pool has been identified as leaking and unstable. Work cranes have been seen working around the building. The IAEA reported that on May 9th work began to structurally support the floor of the spent fuel pool at unit 4. Inspection of the reactor and the main systems. 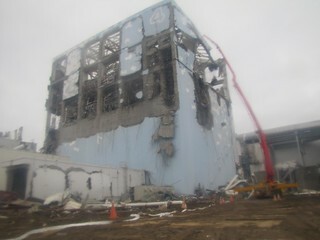 TEPCO has stripped all of the building remains and debris from above the refueling floor in 2012. The containment cap, reactor cap, cranes and other equipment were also removed from Unit 4’s refueling floor. TEPCO has been dogged by rumors of Unit 4’s spent fuel pool being unstable. In 2011 they poured concrete underneath the pool in an attempt to give it more stability. Further examination found that the west side of the building had severe damage to the floors and structural elements. TEPCO assured the spent fuel pool was stable enough to resist an earthquake of about 6.0 but this is only for vertical movement. This assurance does not include horizontal movement of the pool and the building. TEPCO is now preparing to partially cover Unit 4 with a steel clad shed and a crane to remove the fuel from the spent fuel pool.